I can just about understand the need to set aside a day to celebrate record stores; in my book every day should be record store day. It usually is, work permitting. Why would you not want to experience the thrill of digging through crates of records (that can be vinyl or compact discs; we’ll have no snobbery here) whenever you wanted to? Given that Saturday 16 April, is designated as Record Store Day, it seemed timely enough to choose that day to experience what Chester has to offer the record buyer. Chester didn’t have a designated shop selling the official Record Store Day releases. That’s not really an issue, as in some quarters there has been something of a backlash against the day. Major record labels and artists flogging their records at a premium have been seen to hijack the day. This has led to ‘punters’ camping out overnight to purchase official products from selected stores, only for the limited editions to end up on eBay later that day. If you’re to start your record-buying odyssey in Chester, then Brook Street is the place to begin. It’s a street with its own unique character; it also has two distinct record shops. The first, at the top end of the street, if you’re approaching from Hoole, is Woodstock Vinyl. It is tucked away in the equally lovely Becnicks Wonder Emporium; today was all about the vinyl, so sadly there was no time to take in all the different curios that they have on offer. Woodstock Vinyl has been in business for over three years and they have a decent selection of vinyl. There are CDs available but it’s mainly vinyl they stock, including most genres of music. I plumped for a couple of 12-inch singles – remember them – Frankie Goes to Hollywood’s Two Tribes and Tears for Fears’ Everybody Wants to Rule the World. These are records that I had once owned, but that I had foolishly sold, as I rushed to digitize my collection; a decision that I have regretted ever since. This was something I mentioned to the owner Brian Green the last time I was in there. He said he could do a good deal on restocking collection – an offer I have yet to take up. My other purchase at Woodstock was The Wonder Stuff’s Eight Legged Groove Machine album, another vinyl album that I had sold in haste. There was so much on offer; so much so, I had to exercise as much restraint as I could muster and not blow my budget for the day. The copy of Spitting Images’ Chicken Song would have to wait for another visit. Further down Brook Street on the right hand side, you’ll find Grey n Pink Records. It’s long established in the city and was doing a roaring trade on the day, despite it not being an official record store day establishment. There was a great deal to choose from, including a fair bit of prog rock, as you would expect from somewhere named after the 1971 Caravan album In the Land of Grey and Pink. 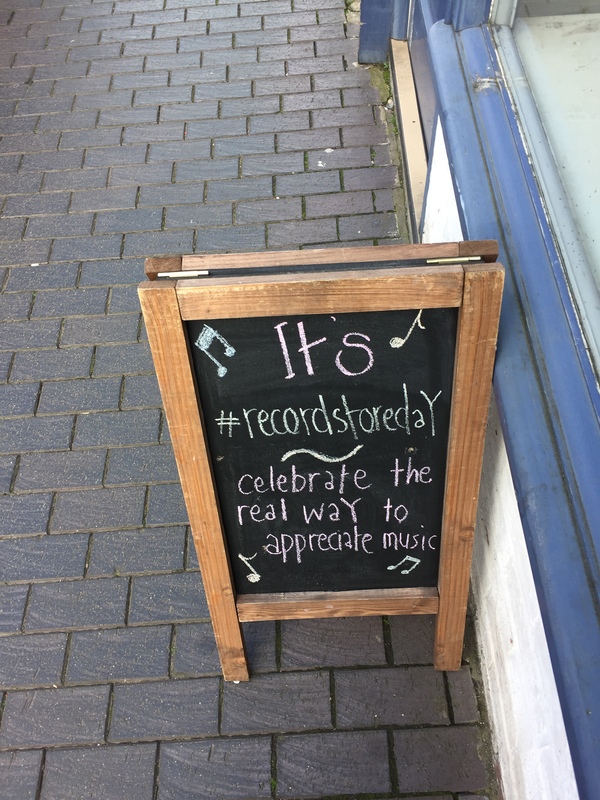 Despite being busy, I managed to chat to one of the owners, Neil Davies who said that the reason that they had not been involved with RSD was that the record labels “made it difficult for record store owners, so [Grey ‘n Pink] would be doing their own thing”. It’s a small compact shop, which has an extensive collection laid out over two floors. In truth, the ground floor has barely enough room to swing a Cat Stevens record. That’s not a complaint; it’s how record stores should be. The space is used effectively and keeping the racks in order is a labour of love for the three custodians of the store, Mike Moran, who opened the store in 1985, Paul Hickman, who has worked there since 1987 and Neil who joined the team in 1988. They are a knowledgeable bunch and are happy to help customers with their queries. We’ve all seen High Fidelity; Grey ‘n Pink’s staff is the antithesis of the record store workers depicted in that book and film. The ground floor is full of 7-inch records, where I whiled away time finding a number of gems and long forgotten records. Discovering Icehouse’s Hey Little Girl was my highlight. Upstairs there is a bit more room and a great selection of 60s records. The Dylan, Beach Boys and The Beatles section fixated me. A tip for any Beatles fans looking for rarities, I would suggest a visit here, there’s much joy to be had. At Grey n Pink, I picked up a number of 7-inch singles; again most of the choices were records that I had once previously owned. It’s a short walk across town to the new kid on the block, Soda Comics, which is based on Watergate Street. The owner is Ben Molesworth, who along with his wife is in charge of the brand – she runs their Altrincham store. They specialise in comics, clothing, graphic novels, posters, and vinyl records. I was focusing on the vinyl today, although the comics, another thing that I collected and long since sold, fascinated me too. That could be the subject of another visit and blog. It’s not a shop that’s designed for the taller members of the community, but it’s worth suffering a few bumps to the head as you scour the racks downstairs under the curved cavern-like ceiling structure. They have a good selection of records in stock, which is updated regularly, so it’s worth repeated visits. I managed to pick up a gem, with a vinyl copy of Peter Cook and Dudley Moore’s Derek and Clive Live album, although I’m kicking myself for not buying Stevie Wonder’s Songs in the Key of Life, gatefold double LP. No doubt that will be gone the next time I visit. The proprietor, Ben, took time out to chat about the store and his plans for the future. Ben said that they would hopefully be getting involved in next year’s Record Store Day, but as they had only just opened they didn’t have time to plan anything for this year. It would be hard to avoid not mentioning HMV when it comes to record buying in Chester. The times I have shopped there I have found the staff to be helpful and knowledgeable. Although, it’s best to keep it independent, when it comes to record buying in Chester. Neil at Grey n Pink said that they have a “number of copies of Blondie’s Parallel Lines, without the mark-up that HMV charges.” So, if you are starting or rebuilding your record collection, then head to your local independent first, as it may work out cheaper for you. There’s a lot to be found in the record stores of Chester, for fear of bankruptcy or the inability to put food on table for the rest of the month I was glad to have stopped when I did. I will be back out on the streets of Chester looking for more bargains on the next record store day, or pay day as I like to also think of it. 57 Brook Street, Chester, CH1 3DZ. Open: Monday to Saturday from 10am to 5pm. Closed Sundays and Bank Holidays.